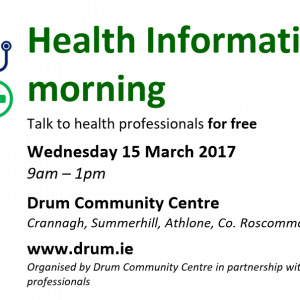 Tá Ionad Pobail an Droma ag tabhairt cuireadh duit ‘cupán tae’ a bheith agat leo chun ‘Seachtain na Gaeilge’ a cheiliúradh ar an Domhnach, 13 Márta 2011 óna 10.30am go 1pm. Beidh taispeántas den saothar ealaíne ag na bpáistí ó Naíonra Réalta Geala, an t-aon réamhscoil lán-Ghaeilge amháin i gContae Ros Comáin, atá lonnaithe san ionad pobail. Beidh Seachtain na Gaeilge ar siúl ar fud na tíre go dtí Lá Fhéile Pádraig. An chuspóir atá leis an bhféile ná úsáid na Gaeilge a chur chun cinn sa saol laethúil. Tá imeachtaí náisiúnta agus áitiúla á n-eagrú ar fud na tíre agus tá sé ar intinn ag Ionad Pobail an Droma a chionn féin a dhéanamh chun ár dteanga dhúchais a chur chun cinn. Chuige sin, beidh maidin caife ar siúl ar an Domhnach, 13 Márta. Is cuma an bhfuil tú líofa sa teanga nó nach bhfuil, tugtar cuireadh duit teacht agus cúpla focal a labhairt, píosa spraoi a bheith agat agus taitneamh a bhaint as cupán tae nó caife. Tá an t-ionad pobail suite sa Chrannach, nach bhfuil ach dhá mhíle taobh thiar de lár Bhaile Átha Luain i ndeisceart Ros Comáin, baile fearainn a bhí ar cheann de sheacht gceantar Ghaeltachta i gContae Ros Comáin de réir Acht na dTithe (Gaeltacht) 1929. Drum Community Centre invites to join them for their annual ‘cupán tae’ event to celebrate Seachtain na Gaeilge on Sunday, 13 March 2011 from 10.30am to 1pm. There will also be a display of artwork by the children of Naíonra Réalta Geala, the only Irish language pre-school in county Roscommon, which operates out of the community centre. Seachtain na Gaeilge runs nationwide until St. Patrick’s Day and aims to promote the use of the Irish language in everyday life. National and local events are being organised across the country, and Drum Community Centre in Athlone is set to play its part in promoting our native tongue by hosting a coffee morning this Sunday, 13 March. Regardless of how much or little Irish you have, you are invited to come along and speak a cúpla focal, have a bit of fun and enjoy a cupán tae. 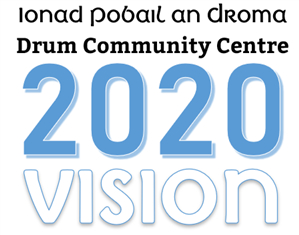 Drum Community Centre is located in the townland of Crannagh, just two miles west of Athlone in south Roscommon, which was one of seven Gaeltacht areas in county Roscommon, according to the Housing (Gaeltacht) Act 1929.